Snakes have a bit of a reputation of being slimy and creepy (not true, but that’s the rep they’ve got). 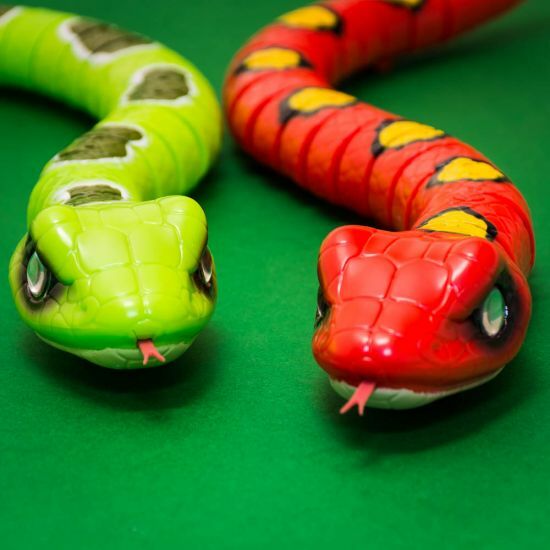 But for those of you who appreciate snakes for the critters they truly are, this awesome Robo Snake, in a choice of scarlet or green, might be just the fella you’re after. Modelled after genuine snake movements, this Robo Snake slithers along the ground like a real snake, has a brilliant realistic tongue-flick motion and even has awesome eye movement - all designed to add a layer of the almost-uncanny to this robotic marvel of a snake. A great toy for kids aged 3 and up, this Robo Snake is a must have machine. Requires 2 X AAA batteries, not included.